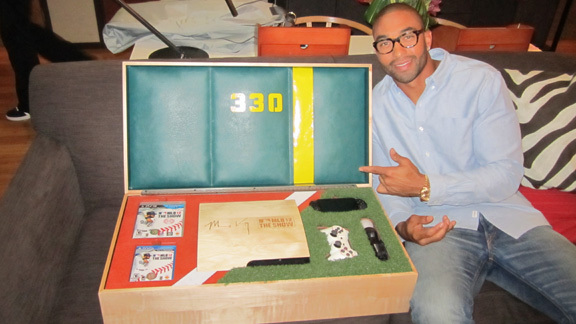 Sony Matt Kemp boasts one of the sweetest customized video game setups I've ever seen. Matt Kemp sees himself in Sony's "MLB 12: The Show" and all he can do is grin. "They have my batting stance down perfect. They have my swing. It's me in that game," Kemp tells me with a laugh. "And he's a pretty good looking dude ... at least I would say so." And when Sony found out that Kemp and his Los Angeles crew of gamers have been playing "The Show" since the game hit last month, the company presented Kemp with his very own, customized PlayStation 3 that looks like it was made out of the slugger's wood bat, complete with baseball-themed controller, a new Vita, and a sweet PlayStation case that even features its own foul line. "This thing is so pretty, I don't even want to take it out of the box," Kemp says, still in awe by the lavish gift. "It's wood grain with my signature on it. It's one of the coolest systems I've ever seen. This thing even has grass and fake dirt surrounding it. It's unbelievable." 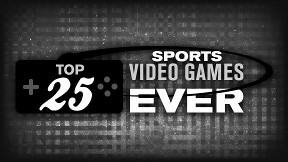 Jon Robinson: Are you a big video game player? Matt Kemp: I used to be bigger into playing, but I still play a little bit. It's tough during the season to find as much time as I want to play video games, and when I do get some free time, I like to sleep. But there are a lot of Dodgers who are into that new Vita system. They're playing "MLB 12: The Show" all the time. They're always playing against each other. First time I went on "The Show," I couldn't believe how accurate they have everything. From the stadiums to all of the batting stances, it feels like you're actually watching a game. Jon Robinson: Did you play a lot of the baseball video games as a kid? Matt Kemp: I did, but my mom and my grandma used to make me go outside and play a lot. So I'd have to go over to my friend's house to play video games. If I was at my house, my parents and my grandparents made me go out and play, and I'm glad they did that because it helped make me who I am today, playing big league baseball, so I'm good for that.